The entire family of Herods were Idumeans, having descended from Abraham and Isaac through Esau. Historically some tension existed between the descendents of Esau and Jacob, since Esau’s line did not experience the Egyptian captivity, nor was it part of the group entering the Promised Land. The Herods tended to side with the Romans rather than the Jews in most secular and even some religious matters. Agrippa II: 27 A.D.-100 (?) A.D.
Named Marcus Julius Agrippa, he was just a toddler when Jesus was crucified. He was born to Herod Agrippa I and Cypros (the daughter of Phasael, Herod the Great’s nephew, and Salampsio, Herod the Great’s daughter). His father was the Herod responsible for executing James (Acts 12:1-2), and for having Peter imprisoned (Acts 12:3). He met a horrible end as described in Acts 12:20-23. His uncle, Herod Antipas, ordered the death of John the Baptist. Jesus appeared before Antipas on orders from Pontius Pilate prior to His crucifixion (Luke 3:1). He had three sisters: Mariamne, Drusilla, and Bernice (aka Berenice or Pherenika). 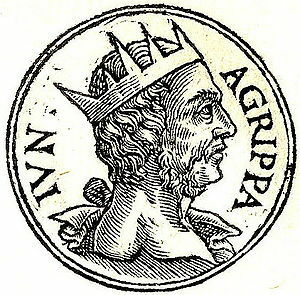 Agrippa II, seventeen when his father died, was deemed too young and inexperienced by Rome to assume the vacated throne. As a result, Palestine became a Roman province to be governed by provincial governors. 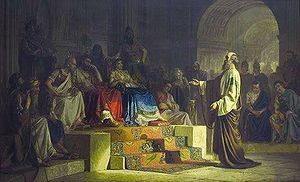 Eventually he was appointed king over several tetrarchies, and curator of the temple in Jerusalem “with power to depose and appoint the high priest and the responsibility of preserving the temple’s treasure and priestly vestments” (The Expositor’s Bible Commentary, vol. 9, p. 548). Though this king was quite knowledgeable about the Jewish faith, law and customs, his private life did not reflect any religious influence. Bernice, the eldest daughter of Herod Agrippa I, first married at age thirteen. When her husband died, she married her uncle, Herod of Chalcis, and bore him two sons. She resumed an illicit life with her brother only to leave him once again for a most shocking affair. Bernice became a mistress to both Emperor Vespasian and his son, Titus, the conqueror of Jerusalem. The latter was so smitten with her that he promised her marriage, a proposal which proved intolerable even to the Roman Senate with all its depravity. Bernice is mentioned three times in Scripture: Acts 25:13, 23, 30. Each has to do with legal proceedings involving the fate of the apostle Paul. She appears at the side of her brother, unabashedly as his consort. Drusilla was the youngest daughter of Agrippa I—ten years younger than Bernice. She was only six years old when her father died in A.D. 44. Already beautiful, she had been promised in marriage to Epiphanies, son of the king of Comangene. When Epiphanies refused to go through a prerequisite of circumcision, the agreement was rendered void. However, another suitor, Azizus, king of Edessa, was willing to comply, and obtained her as his wife. True to her heritage, Drusilla was enticed away by a man named Felix. Josephus says, “Felix was procurator of Judea, he saw this Drusilla, and fell in love with her; for she did indeed excel all other women in beauty.” According to the historian Tacitus, Claudius Felix was a base man. He “had been a slave, in the vilest of all positions, at the vilest of all epochs, in the vilest of all cities.”  As a procurator he “exercised the prerogatives of a king, with the spirit of a slave, rioting in cruelty and licentiousness” (Tacitus, Annals 12:54). “He sent a Jew to persuade her to forsake her present husband, and marry him,” promising he would make her a happy woman. She accepted, in part to get away from her jealous sister, Bernice. Eventually she bore him a son, whom Felix named…Agrippa. According to the International Standard Bible Encyclopedia, this son perished under Titus in an eruption of Mt. Vesuvius (see article, “Drusilla”). With the death of Herod Agrippa II, the Herodian dynasty came to an end. All that is left is the sordid account of a brutal, ruthless, dysfunctional family that left its mark on the lives of Jesus, his disciples and apostles, believers, and the very fabric of Palestine itself. Barnes’ Notes, Acts 25:13, Electronic Database Copyright © 1997, 2003 by Biblesoft, Inc. All rights reserved.